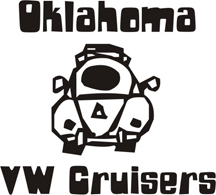 Oklahoma Vw Cruisers • Silly car dealers! would be a nice car except the guy in kansas cutup the front end bad. I've seen that one in Tulsa a couple of times. Cool air bag set up, but completely removed all front suspensionand a fair bit of the sheet metal. The guy pulled it out of a field. Perfect don't cut vintage cars poster. I'm sure he made his $800 so he didn't care.